Gearing to 14/51 - anyone else? Hello all, I did look through the chains and sprockets thread and searched too, but my combo is pretty weird I guess. Anyone else running 14/51 for offroad/dual sport? I was running 13/47 for the TAT but wanted to give more space for the swingarm pivot (I chewed through my last one quite a bit). I'm using a 114 link chain. Thoughts? Where will I see the wear, the sprockets (steel) or the chain? If you are using the bike in the dirt forget about the repetition of the same link hitting the same tooth stuff. Getting some dirt on the chain will do way more damage than that. I'd run 14-51 over 13-47 any day on a WRR. The only reason im running 13-48 instead of 14-51 is the giant SRT chain I have, its has a little taller side plates than DID chains and wont fit on the bike with a 14 front like the stock chain did, I'd have to remove the case guard to run it, I ran 14-50 with a slightly clearanced stock case guard and a lengthened stock chain before going 13-48 with the SRT. My chain guide is doing alright tho, it wore about 1/2 way really fast when the bike was almost new then stopped wearing. 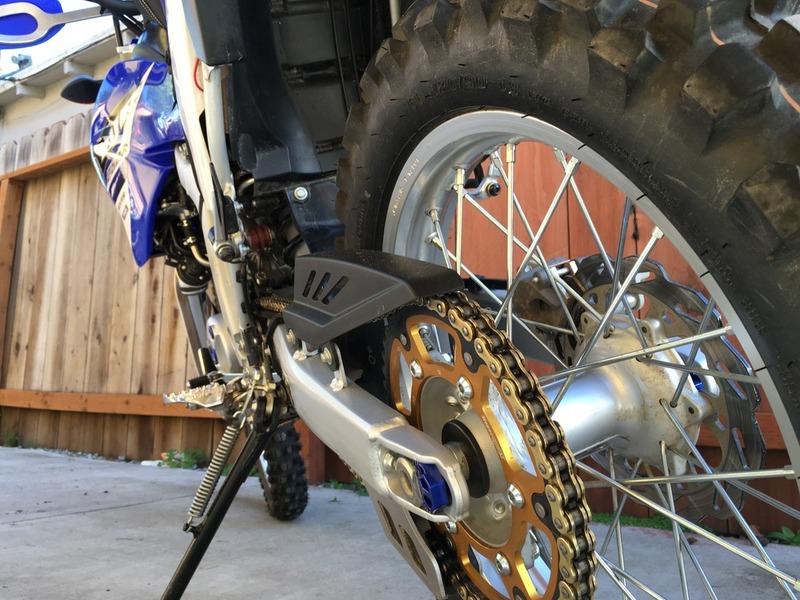 I will buy a DID chain and 14-51 sprockets next time I need chain/sprockets, the bigger front sprockets last longer making the chain last longer plus extra room around the swingarm is a bonus. I bought a 14/51 combo but haven't installed it yet. Hopefully in the next few days. I wouldn't worry about the tooth contact thing... Like biglake said, it's a dirtbike. That'll wear it down quick. Plus... My chain was like $65 for a gold o ring primary drive chain from Rocky Mountain. Not exactly a bank breaking investment to replace every few years. Has anyone successfully used 14/51 on a 112-link chain? My calcs make it look like a borderline case. I run 13/51 with 112 and am at the tight end of adjustment range. Wouldn't want to go any tighter. No problem. If interested, I posted a photo and a few installation notes previously in my photo thread. I put a 51T rear on and it was little too much for off road. I never even needed a 1st gear. So I put a 14T up front so now it's 14/51T which would be the same as 13/48T (well 13/47.5T) Also on the 51T only just fits. My recommend for would be 13/49 for more off road of 13/47 for off and on road. The stock 13/43T would be great if the bike was a 350cc but for my 220Lb of weight the little 250cc need the bigger ratio! I'm thinking of going back to 13/51T combo for this weekend. I ideally trying to find a way where in slow corners I can just stay in 2nd - go from 10-40mph. I only really ride off road. I saw your similar post in the recent 13/48 gearing thread. 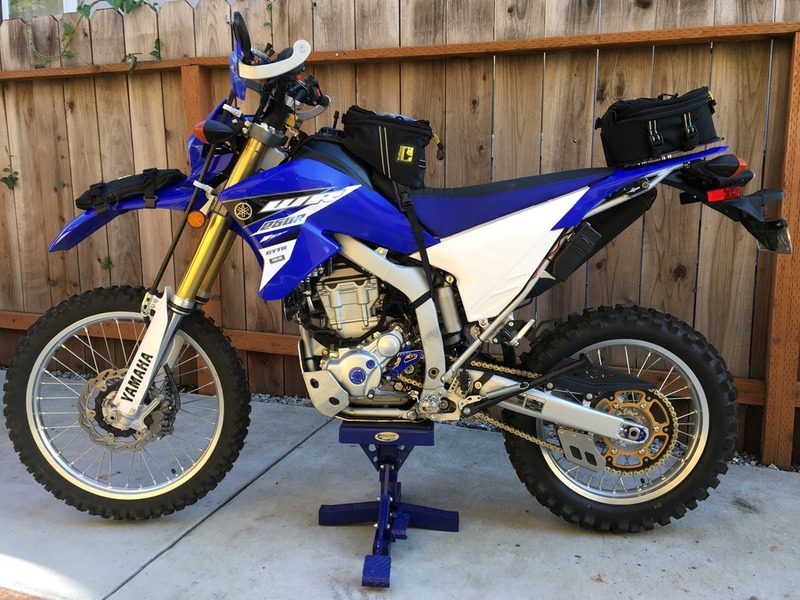 Just curious, since you "only really ride off road"... what is your idea of off road riding with this bike, and how much of it do you do? Do you mean gravel roads or single track trails? I moved to 13/51 gearing after repeatedly struggling with low speed stalls and tip-overs on tight steep mountain trails. I absolutely love this lower gearing and use 1st gear frequently on mountain trails, often at low RPM range. I can still easily do 65 MPH at ~8000 RPM on the pavement. Not saying my setup is best, or that yours isn't, because we obviously have different expectations and riding styles. 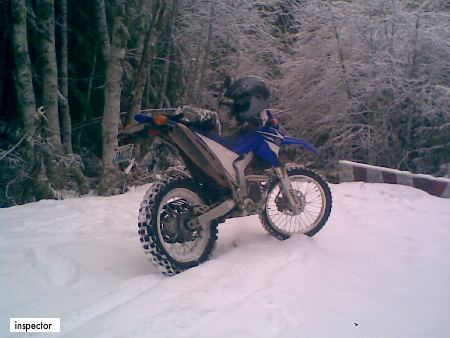 I'm just trying to understand why you feel 13/51 gearing is too low for off road riding. I ride mainly in dual sport events and ohv parks in Socal area. It's all desert here and found the 13/51 was reving out a little too quick where the 14/51 was little better. Mainly going 10-50mph most of the time. The only slow bits are normally deep sand sharp corners. I'm going to switch back to the 13/51 this weekend and try use 3rd gear more. I really liked the 13/51 set up (with full FMF, programmer, airbox mod) as I could slow right down in a deep sand sharp corner to 5mph and then gas it out and the little 250 pulled like a tractor! I just wish it didn't rev out so fast which is why I switched to the 14/51. Update - did a 3 hour (all off road) ride this morning with the gearing at 13/51T. Once I got more comfortable with using 3rd gear I really like this set up. I tried some much harder tight trails and was crawling over big rocks in 1st with no stalls. I will leave like this. When I replace the set I try 13/49T and see if it's a good middle ground. I just put a 50-tooth Vortex on back, very nice machining. On 112 links it gives me adjustment room with a 14t front, and it's easy to swap out to 13t and know just where to set for chain tension. Felt great, rode around in idle at 3mph, crawled up a couple hills here -- and that was with the 14. I have a 14/50 and 13/50 set up. The chain is Primary Drive X-Ring Gold 112 links. Chain Tension is set properly. Subject: Re: Gearing to 14/51 - anyone else? » 930 vs 205 gearing.